I've heard it said that card isn't durable. Well, whilst I've always thought that to be tosh, I think this model is proof. Like my hero, John Aherne, I shellacked this structure as soon as the basic shape was done, THEN I covered it in Slater's brick sheet. The card it's made of is a combination of Daler and CS10 lineboard. When I was a technical illustrator, we used to buy line board by the pack of a dozen.Last time I saw any quality lineboard for sale it was a single sheet of CS10 and it sold for....'ang on to yer 'at....£150!! Anyway, this model is now well over 30 years old, it has followed me around in all my moves, been squeezed into boxes sometimes, stored in damp barns and caravans and still looks good, better, in fact, than it did when first made, because it has mellowed with age and dust. 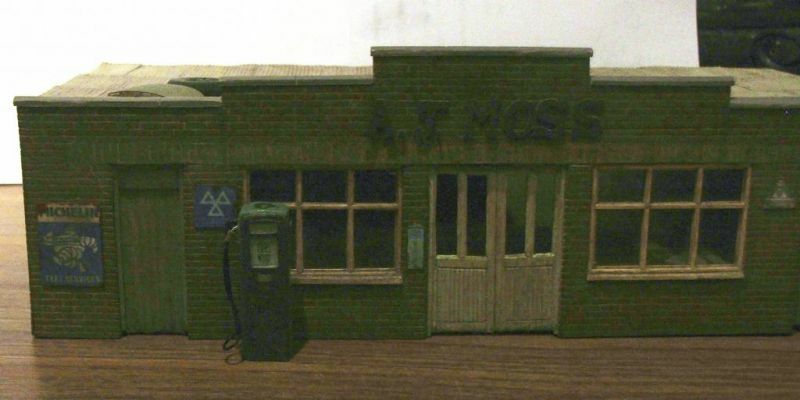 It is an accurate model of my friend's country garage, Riverside Garage in Upwell. Now, alas, due to vandalism and Euro rules and costs he no longer uses the place. Even he had to give up when the soldier course and then the roof started to cave in. The site is earmarked for redevelopment, so, like so many country garages, it will be lost. Time was, this place had outside lines of what are now called superclassics. Austin-Healeys for 300-350 quid, Nathan racing Imps, Big Yank racers, even a Piper GTT! (I had a Healey and a Piper too back in the day). There's still a sit up and beg Ford Pop in Battleship Grey in the workshop! This model will become the centrepiece of my Wisbech and Upwell set-piece when I finish Lantern Yard. The drooping doors have always been there! Yet they always open and shut smoothly. Tony used to do his paperwork on that table inside the window and many a long world correcting conversation was had in there over strong tea made in the workshop next door, which I will also get round to finishing soon. 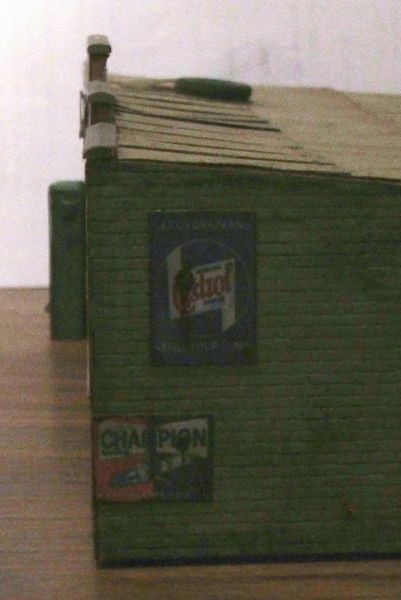 This model shows Slater's brick sheet laid so that corners are blended with Mek-Pak, then when thoroughly set the mortar courses are carried round with a three square Swiss needle file. More important, almost, is to flatten those bricks, especially on brick sheet made by SEF, which is not made by so crisp a method and is simply vac-formed. Both makes need a block of sandpaper covered wood rubbed all over it until the mortar barely shows, or it will always look like round edged setts, more suited to the road than a wall and the light will always catch on the rounded edges, ruining an otherwise good building. Oh and yes, the office IS stretcher bond built. The workshop is Flemish bond, due to its size. The corrugated roof is aluminium foil made in a press I made from styrene rod, but painted to look like asbestos and (no pun intended, Tony) moss. Old car junk is thrown up on top, a wheel an old windscreen (cut from an unbuilt model car kit and dirtied up, a brass wire exhaust, etc. The name was added to a model boat fret I had made years ago as was the pump body and dial. You could get etching done cheaply then, before PCs were required. Painted, as always, with enamels, detailed in gouache and weathered with fag ash (I smoked back then) and ground chalk pastels. I also had some Pelikan Plaka paints in those days, but alas, they disappeared years ago. I also had jars of Pelikan Plaka paints many years ago. They carried more health warnings than a nuclear reactor! Thanks Terry. I do love my buildings. Plaka had warnings? Damned if I knew, but then I spray cellulose paints to this day. Can't wear a mask as I can't breathe in one and it steams up me glasses! But I always do it outside anyway. 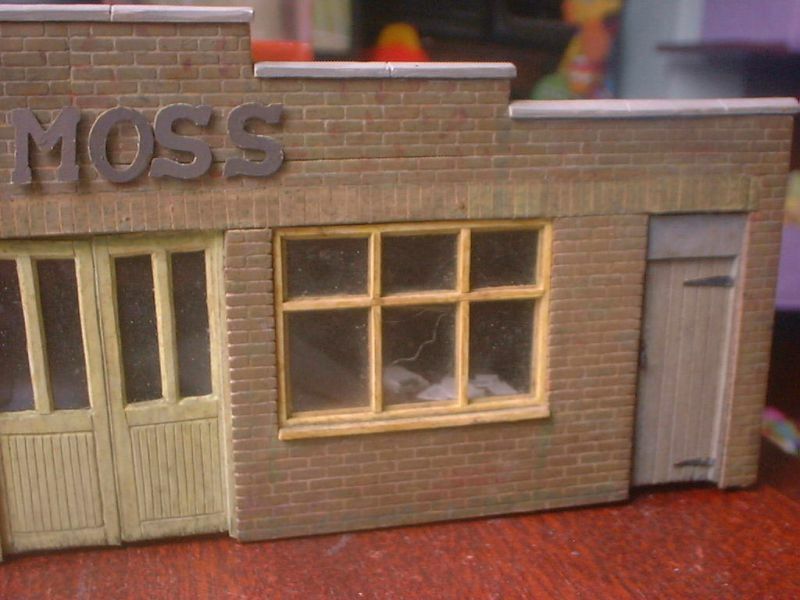 Beautiful model – it'll look lovely on a layout with a few trees and weeds around it, and a bit of garage grime. Definitely one to keep! You are here: Your Model Railway Club > More Practical Help > Scratchbuilding. > Card not durable?..